Little Saltings Brancaster holiday cottage, close to beach and saltmarsh. Extra cottage sleeping 2 available as extra so property can sleep up to 10 guests. 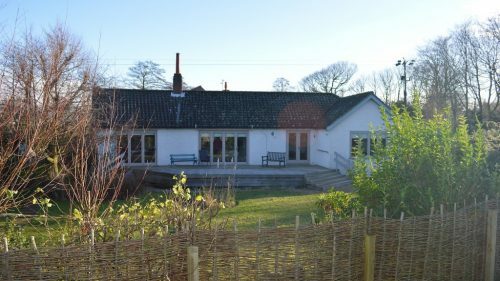 If you are looking for a Brancaster Holiday Cottage that is a little different, then Little Saltings truly is in a unique position, it is situated at the end of a track right on the coastal path. The entire property sits in a Conservation Area, Area of Outstanding Natural Beauty and abuts a designated SSSI, Ramsar site and SPA to the north and west. The Coast Path is also right on your doorstep. From the fabulous deck overlooking the garden you can sit and stare over its own 10 acres of salt marshes where you can watch geese, barn owls and all manner of migratory birds from the comfort of your chair. And of course the amazing sunsets. The famous National Trust beach at Brancaster is so close you will be able to hear the sea when the tide is high. 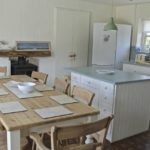 The property sleeps up to 8 but it has the option of renting Brancaster Cottage which is next door, to a maximum of 10 people. (Please note other guests may be renting this property during your stay) Perfect for multi generational holidays, or just if Granny and Grandpa wanted a bit of space! The house has a homely feel and is somewhere you can relax and not worry about children, they will love exploring the gardens. 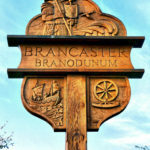 This really is a special Brancaster holiday cottage. It is a bird watcher’s and wildlife lover’s paradise. Just a short walk in the opposite direction into the village you will find The Ship pub. The Coasthopper Bus stop is just at the top of the road giving you total freedom to explore the coast whilst leaving your car behind. Open Plan Kitchen\Diner – Super open and light space with bi fold doors to the deck giving uninterrupted views over the salt marshes. Wood burning stove. Well equipped kitchen with induction hob, electric oven, microwave, large fridge freezer, dishwasher and good range of cooking utensils and small appliances. Large farmhouse style table seating 8 overlooking the garden with views over the marshes. Original parquet flooring. Sitting Room – spacious with leather sofas and coffee table, wood burning stove, large TV with FreeView and dvd player. Large glass doors to deck and again wonderful views over the marshes. Rear Hall – great for taking off boots and coats and drying wet dogs. Cloakroom with shower, basin and WC. Coat hooks and storage cupboards. Bedroom 2 – Twin Room with one full size single bed and pull out full sized single truckle bed. Wardrobe. Children toys. Book shelves. Window to rear. Bedroom 3 – Double bed with bedside table and lamp. Wardrobe and book shelves. Family bathroom (access is through either master bedroom or Bedroom 4) With large bath, WC, bidet and separate shower. Washing machine and tumble dryer in concealed cupboard. Note there are steps up to both the front and back doors. Little Saltings really is situated in the most idyllic position, right at the end of an unmade track nestling under the sea defences. The next stop is the salt marshes and the sea beyond, you cannot stay much closer to the beach. The property owns the surrounding salt marshes, over 10 acres in all and these are a wildlife haven for all manner of birds and mammals. You will almost certainly see either Marsh Harriers, Buzzards, geese and if you are very lucky Simon the Barn Owl with his nightly fly pasts. The gardens are fenced and reasonably secure although you may have to watch escape artist dogs as some parts are hedged. The deck leading from the kitchen and sitting room is wonderful. On a warm night you can fold back the doors and really let the wilderness in. There is no light pollution so star gazing on a clear night is just amazing. The walk to the beach will take you around 10/15 minutes There is parking to the front for three or four cars.